After the result of the signings didn’t go to plan, the club were heavily criticised for taking in so mnay new players. 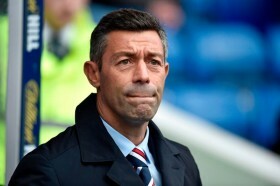 This time, though, under manager Graeme Murty, Rangers’ recruitment drive has a back-to-the-roots feel about it, compared to the exotic experiment Caixinha was conducting. Critics have said Murty and his director of football Mark Allen’s identification of January transfer targets is confusing in the bigger picture. However, whatever you think about their approach to signing, no one can argue that taking on a host of players on permanent and loan deals with the promise of something more later in the year is energising both the club and fans. What Murty needs to do now is erase all doubt that this is a last ditch attempt to bring Rangers back together and prove that it is, in fact, a well thought-out master class in management. Murty has more than proved he is making positive changes for the Gers since Caixinha after taking points from Celtic at Parkhead and beaten Hearts at Murrayfield in his spells as caretaker. And now he is trying to make his mark on the squad by restoring the deep rooted sense of pride in wearing the Gers jersey that has been lost and forgotten due to recent managerial disasters. The aim of this January’s signing spree is to try and pull together a short-term impact with a long-game strategy with players who should be about both the present and future. Like going for players like Greg Docherty, who is a fine example of a player who would do anything for a team. Whether or not the Gers are prepared to spend £600,000 is another issue, but they’re still on the right tracks. Landing Jamie Murphy, who gave the impression he would do anything to get to Ibrox, is exactly what Rangers needed. Taking on Russell Martin was a genius move from Murty. Bringing this 32-year-old to Ibrox will mean getting a player who is key to rebuilding Rangers and who is a great leader. However, he will still be contracted under his parent club until the summer of 2019. It was different when they decided to take on Sean Goss, who is only being seen as a short-term solution. Queens Park Rangers made it perfectly clear that his move to the Gers is purely for learning and gaining experience before going back in five months’ time. It suits both parties, because there is no real long-term benefit for Rangers to permanently take on another midfielder when the position is already over-populated. Rangers also made a £350,000 bid for Kilmarnock’s Jordan Jones, however Killie’s chiefs have slapped a £1 million price tag on the midfielder now that he carries the tag of a full Northern Ireland international, and calling the Rangers bid an insult. As the days go on, more and more possible targets for Rangers are being identified by Murty and Allen. Only in time will fans see if this approach to signing will turn out to be just another last-ditch attempt to bring the club together, or a properly thought-out master class in management.